The village of Chellaston was added to the parish of English Martyrs’ in 2001 after the suppression and division of the parish of the Holy Spirit, Sinfin by the Bishop of Nottingham. According to tradition the name Chellaston derives from the SaxonCeoleardsbeorge or Hill of Ceolheard. 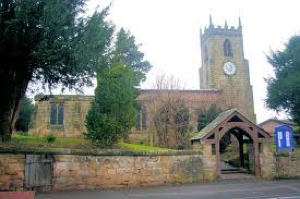 The village is first mentioned in a Charter of 1009 when it was just one village of a number held by the Bishop of Carlisle as owner of the manor of Melbourne. Indeed, the church of Saint Peter’s in Chellaston was in the gift of Melbourne until 1863 when it was constituted a separate ecclesiastical parish. At the time of the Norman Conquest the Bishop of Carlisle held the lion’s share of the land in the area but he was not the only substantial landowner. A separate manor of Chellaston was held by the Saxon thane Wulfsi who held considerable estates in Kedleston, Radbourne, Bradbourne, Risley and Weston Underwood; alas, he was dispossessed by the Norman rulers who granted Chellaston to Amalric of Caen. The present Church of Saint Peter’s was founded during the Norman period although the main body of the church today dates from the fourteenth and fifteenth centuries.